Sign up to Dry July Australia 2018 and raise funds for W.P. Holman Clinic Launceston. The W.P. Holman Clinic Launceston offers patients in Northern Tasmania chemotherapy, palliative care, and radiation treatment. The clinic is a 3 linear accelerator and 12 chair chemotherapy centre, operating out of the Launceston General Hospital providing a high quality of care to all patient's. Attached to the centre is patient accommodation for those required to travel for treatment. Help us raise funds to enhance areas around the centre making them more comfortable for patients. The prior year provided entertainment items and equipment that makes patient's treatment time more comfortable. The major acquisition was new furniture for the patient waiting area in the Burnie Hospital. Funds raised by Dry July supporters have previously helped patients in the north west by sprucing up environments at W.P. Holman Clinic at the Launceston General Hospital and at nearby Spurr Wing which offers dedicated accommodation to cancer patients and their families. We're proud to announce that W.P. Holman Clinic Launceston has received a grant from the Dry July Foundation 2018 Grant Program. If it wasn’t for his wife, John felt that in a couple of years time he could have been dead. He had received a bowel screening test and had thrown it aside with the other he had received twelve months earlier. His wife Anne kept on asking him if he had done the test and said to do it. To shut her up he did it and it came back positive for both samples. A colonoscopy was done where they found a polyp which couldn’t be removed due to its size. A CT scan was done where they found I had lung cancer. This was on 16 December 2016 and on December 22, I was in the Launceston General Hospital, Launceston, Tasmania, having a bronchial tube put down into the lung for a biopsy which confirmed that I had lung cancer. He has been on Facebook about his journey and now tells everybody – male and female – to do their tests. You can laugh about it but the sooner you find it - if its there - the better you are. 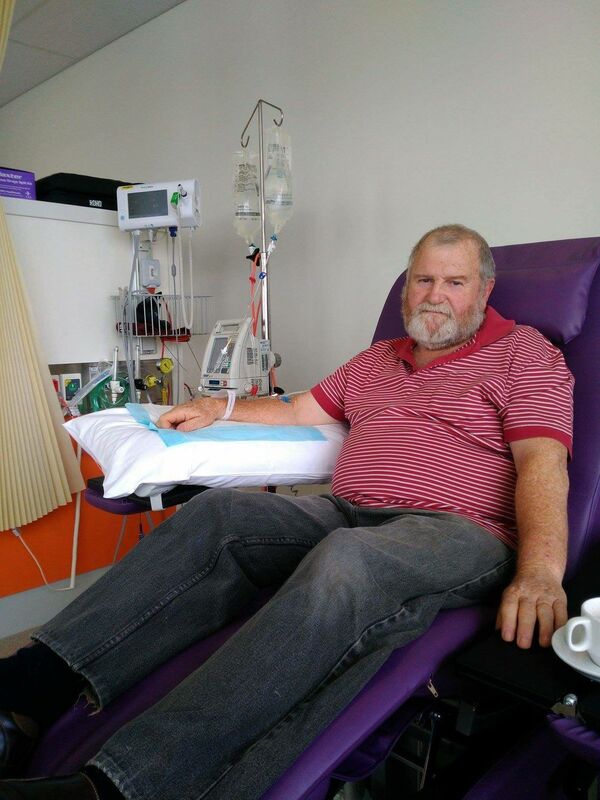 John’s treatment plan involved two and a half cycles of chemotherapy at one week each cycle. He was due to start a third cycle but his veins weren’t cooperating very well and the blood tests weren’t flash. The medical team advised that he had responded very well to treatment. John had thought he would have no more needles but his doctor then sent him down for blood tests. At the same time, John also undergoing radiation therapy every day baring the weekend and public holidays for about 35 days. The major chemotherapy side effects for John weren’t the loss of hair or feeling nauseous rather he had trouble sleeping and admits to being short tempered some times. John has a bigger bump in the road as recent tests have found cancer meaning he may be up for more treatment in the future. A Wellness Centre was built on the ground floor of the North West Cancer Centre and is devoted to the wellbeing of patients who require access to cancer services in Tasmania’s North West. As a meeting space and furnished using Dry July funding, the Wellness Centre contains a lounge area and kitchen with access to a private courtyard. Services available include counselling and regular cancer support events for patients and their families. On his first day arriving for treatment and every day after that, John said the first thing that struck him was the behaviour of the staff – the girls at reception and oncology, and the nurses. They were good and they all cared. The Wellness Centre itself was homely and you could relax and the atmosphere was such that you didn’t feel that you were sitting in a waiting room with other sick people. The centre provided a space for John and Anne to take time out of the treatment area and they could also converse with other patients talking about their journeys too. You can have a cup of coffe, a chat and staff would come and get you when you had radiation or chemotherapy. Staff would say you are next or come through and would often wait until you had finished your coffee. When John’s daughter and her daughter were down from Queensland and they couldn’t believe what was available. The seating and main dining table in the centre was a great place to sit and have a quiet break when you neede it, or you could engage with others if you wanted. John also appreciated the voulunteers contribution to the centre who he found many of them had a cancer experience themselves and it was obvious that they were giving back to the centre themselves. If there was anything John would recommend, it would be to develop a similar yet smaller room be developed on the third floor for those patients undergoing chemotheraphy. He firmly believes if anybody is in a position to participate in Dry July and support the Wellness Centre, that they will not be sorry because its worth it. Dry July funds have made a real difference to the lives of people affected by cancer in Tasmania’s North West – including his own. Dry July funding has delivered a comfortable environment for patients and their supporters attending the new Wellness Centre at Burnie Hospital. Some patients can be sat in chemotherapy chairs for up to 8 hours during treatment. North West Regional Cancer Centre intends to use Dry July funds towards purchasing individual TV / entertainment units, to offer a distraction to patients. The new North West Cancer Centre in Burnie will be fully operational this year, offering support to North West Tasmanians receiving cancer treatment. Patients will soon be able to receive radiation oncology and other services in Burnie without needing to travel to Launceston. Funds raised by Dry July in 2015 are being used to furnish a patient support and wellness centre at the campus. Items to be purchased include AV equipment, tables, chairs, couches, crockery and cutlery.